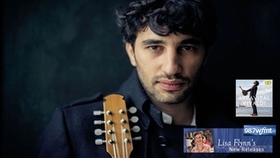 Acknowledged by The New York Times for his "exquisitely sensitive playing" and "stunning agility", Grammy-nominated mandolinist Avi Avital is one of the world's most exciting and adventurous musicians. He is deeply committed to building a fresh legacy for the mandolin through virtuosic performance in a range of genres and commissioning new works for mandolin. 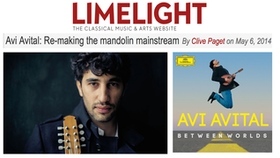 Avi Avital is the first mandolin player to receive a GRAMMY nomination in the category "Best Instrumental Soloist" (2010) for his recording of Avner Dorman's Mandolin Concerto (Metropolis Ensemble/Andrew Cyr). He has won numerous competitions and awards including Germany's ECHO Prize for his 2008 recording with the David Orlowsky Trio and the AVIV Competition (2007), the preeminent national competition for Israeli soloists. Born in Be'er Sheva, southern Israel in 1978, he began learning the mandolin at the age of eight and soon joined the flourishing mandolin youth orchestra founded and directed by his charismatic teacher, Russian-born violinist Simcha Nathanson. He later graduated from the Jerusalem Music Academy and the Conservatorio Cesare Pollini in Padova, Italy where he studied the original mandolin repertoire with Ugo Orlandi. Avital has released various recordings in the disparate genres of klezmer, baroque and contemporary classical music. He now records exclusively with Deutsche Grammophon and his debut release featured his own transcriptions of J S Bach Concertos for harpsichord and violin. His second disc "Between Worlds" introduced chamber music compositions from Ernest Bloch and De Falla to traditional Bulgarian Folk tunes and was released in 2014 to critical acclaim. He records Vivaldi Concertos with the Venice Baroque Orchestra for release in 2015. Recent highlights include Concerto performances at the Schleswig-Holstein Musik Festival, Aspen Music Festival, Performances of "Between Worlds" at the Salzburg Festival, Vienna Konzerthaus, Poisson Rouge NY, Bremen Sendessaal, Rolandseck, Seoul, Castellar Festival and the Riga Festival whilst recitals included the Rheingau Festival, Musikfest Bremen, Schoss Elmau, Bristol Proms, Carnegie Hall Presents and Vancouver Recital Society. Forthcoming engagements include Concertos with the Mahler Chamber Orchestra, Kremerata Baltica, Venice Baroque Orchestra, Kölner Akademie, Geneva Camerata, Israel Camerata, Lithuanian Chamber Orchestra,Wroclaw Philharmonic, Hamburg Symphony and I Musici di Roma and an extensive tour of the USA and South America with the Venice Baroque Orchestra. He makes his solo recital debut at the Wigmore Hall and other recitals include the University of Chicago, Stanford University, Cremona, Salle Gaveau, Globe Theatre in London, Manchester Chamber Concerts Society, Dortmund Konzerthaus, Montreal Bach Festival, Verbier Festival, Buenos Aires, Taiwan, Cartagena Festival (Colombia) in collabroations with Mahan Esfahani, Ksenija Sidorova, Ray Chen, David Greilsamer, Andreas Scholl and the Danish String Quartet. 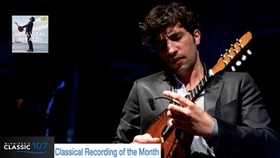 According to Deutsche Grammophon recording artist Avi Avital, while the bass is not bad, it's more about that mandolin. Which is also what this whole episode is about! Avi tells all: Where did the mandolin come from? Who composes for it? Why does he advocate for such a strange instrument? And how much did he play that one REM song in high school? Learn all of this and more right here! 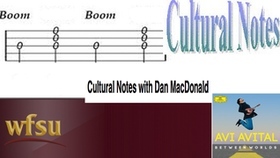 LISTEN TO THE KUHA: Houston - Classical Classroom SEGMENT Music in this episode: The Music of Brazil / Jacob do Bandolim, Vol. 1 / Recordings 1949 - 1958. "Choro de varanda". Mike Marshall and Chris Thile: "Fisher's Hornpipe". From Into the Cauldron. Hamilton ee Holanda: Choro Caprice for Caprichos. Ludwig van Beethoven: Sonatina for Mandolin and fortepiano in C Major. Diego Fasolis and Duilio Galfetti. Domenico Scarlatti: Mandolin Sonata in D minor Allegro. Camerata Mandolinos Classico. Wolfgang Amadeus Mozart: Don Giovanni, "Deh vieni alla finestra". Johann Nepomuk Hummel: Mandolin Concerto in G major, S. 28. REM: "Losing My Religion" from Out of Time. 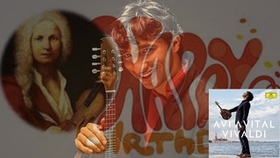 Antonio Vivaldi, from Avi Avital's CD Vivaldi: Concerto in A minor RV 356 Largo from Converto in C major RV 443 Concerto in G minor RV 315 "Summer" from The Four Seasons. Audio production by Todd "Terrific" Hulslander with electric slides by Dacia Clay and editing by Mark DiClaudio. New Classical Tracks is a Syndicated Feature airing Nationally on Classical 24 & Statewide on Minnesota Public Radio. 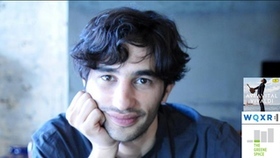 Listen to Julie Amacher's Feature with Avi Avital Treviso is a charming, historic town with Renaissance squares, palaces, richly frescoed churches, and streets woven with ancient waterways. 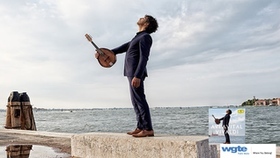 According to mandolinist Avi Avital, this quiet, stress-free gateway to Venice was the perfect place to record the music of the Baroque master, Antonio Vivaldi. He was from Venice, and so is the orchestra on this disc. "While recording Vivaldi, obviously, I really wanted to do it with them because recording this Venetian music with an orchestra that's actually all from Venice just added this extra spice to it. You perform, you rehearse Vivaldi in the lunch break, you eat Venetian food, in the rehearsal everyone speaks Venetian dialect. You're surrounded with Venetian culture. It was a wonderful experience and that's what gives them this extra beat when playing Venetian music." If Avi Avital was to record all the Vivaldi concertos written for mandolin, this recording would be about 16 minutes long. That's why Avi has created some new mandolin arrangements of Vivaldi's other concertos. Initially he was concerned about blending the sound of his modern mandolin with the period instruments of the Venice Baroque Orchestra. In the end, what was important was not the instruments themselves, but how they delivered the authentic message through the music itself. "During the rehearsals, for example, I was avoiding the tremolo, the one technique that is so much associated with mandolin, for producing long notes," Avi explains, "because it wasn't a common technique in the Baroque but also because for me always a tremolo was a sentimental thing, a more romantic thing, and when I play Bach and Vivaldi and Baroque music in general, I tend to avoid that kind of throwback to this nostalgic feeling. So we rehearsed the second movement of Summer by Vivaldi and I was plucking it without any tremolo and trying to keep it elegant and clean. And just for fun in one of the takes, I started to play a little bit of tremolo. And all of them stopped and said, 'Do more of that! It's gorgeous!'" Summer has always been Avi's favorite of Vivaldi's Four Seasons. In fact, a ferocious summer storm blew its way through Venice one afternoon while Avi was preparing to record this work. "You have to really experience it before playing Summer, and I did," he says. "It was a hot summer day and just five minutes before we went to a concert playing this Summer, an enormous hailstorm started to come from the skies. We were all wet and overwhelmed by the surprise of this storm. It went as fast as it came and that was an 'aha' moment for me when I, ten minutes afterwards, played exactly what happened the way Vivaldi describes it in his music in Summer." The Violin concerto in A minor comes from Vivaldi's influential set of 12 concertos called L'Estro Armonico. According to Avi, it's probably the most famous concerto of the set. "For me, this piece is specifically associated with youth," Avi says. "This is the first concerto that everyone plays after two or three years of violin lessons. For myself, and for everyone in the orchestra, it was very much connected with our youth. While recording this piece, we told ourselves, 'Forget what we know about this piece and try to play it like it's the very, very first time you ever heard this music and every cadenza and every sequence blows your mind away,' because the first time you listen to this music, that's the effect. So we were all having this very nice moment in the studio where we really tried to imagine that we were playing it as kids, but of course with the knowledge and the technique and the experience we have as adults." After weaving your way through the six instrumental works on this recording, you can lose yourself along the Grand Canal of Venice with Peruvian tenor Juan Diego Florez. "That was a very special thing to have him on the album," Avi admits. "I feel very lucky about it. He's just amazing. It's a folk song from the time of Vivaldi. It's in the Venetian dialect and the text is folkloristic - a little bit rude, even. The idea I had was for the people to imagine that they're hearing a concert of Vivaldi's music in Venice at that time in the church or the theater. The concert ended, and now they walk out and they take a gondola back home, and this would be the music they would hear on the streets or in the canals of Venice. This is the real folk Venetian music." 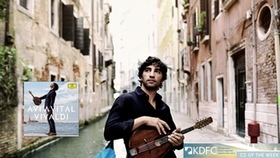 This new recording of Vivaldi's music with mandolinist Avi Avital and the Venice Baroque Orchestra is not just a delightful concert, it can be your own personal gateway to Venice. 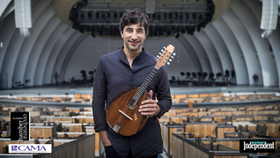 The GRAMMY-nominated Israeli mandolinist Avi Avital has been praised as a both an "enthralling and sensitive soloist" (Boston Globe) and a "convincing advocate for his instrument" (Wall Street Journal). As the first mandolinist signed to Deutsche Grammophon, he has brought the instrument to entirely new audiences, building a fresh legacy for the mandolin through virtuosic performance and a commitment to commissioning new works and arrangements in a range of genres. On his new release: Vivaldi, his third album on DG Avital returns the instrument to its origins-the Venetian Baroque and master composer Antonio Vivaldi and captures the mystical spirit of Venice, shedding new light on Vivaldi's musical genius by performing his own transcriptions of the composer's works. The Mandolin virtuoso discusses his new release with WGTE: Toledo - Brad Cresswell. Listen to the interview. An ordained priest, Antonio Vivaldi was one of the most prolific composers of all time creating hundreds of works. Renowned for his concertos and operas, including Argippo and Bajazet, Vivaldi's influence, innovation and contribution to the Baroque Period was significant. 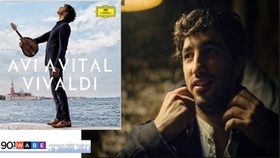 Avi Avital's celebrates the composer and the great VBO orchestra on his new DG release - Vivaldi. Avital says: "Working with the Venice Baroque Orchestra is a great experience. All the players live around Venice and are surrounded by the culture of this unique city. You can hear their incredible understanding of its history in every note." Vivaldi was born in Venice on THIS DAY!! March 4th in 1678. Happy Birthday Antonio CLICK FOR Avi singing Happy Birthday to Vivaldi! 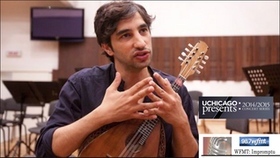 Israeli mandolin master, Avi Avital has had a lot of experience transcribing music to fit his instrument since there is relatively little music written specially for the mandolin. In the case of the Vivaldi Mandolin Concerto in C, however, he has the pleasure of performing a great work in its original form. That being said, this new recording also contains a host of Avital's nimble transcriptions, from Vivaldi Concertos for lute, violin, and recorder, to a Venetian Gondolier song, sung by one of today's most popular tenors, Juan Diego Florez. As our CD Of the Week pick, we'll be featuring tracks from 'Vivaldi' throughout this week on KDFC: San Francisco. 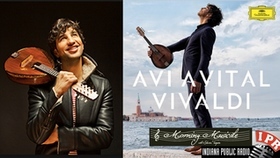 GRAMMY®-nominated mandolinist Avi Avital has been called one of the world's most exciting and enterprising musicians, deeply committed to building a fresh legacy for the mandolin through virtuosic performance and distinctive new repertoire while celebrating the instrument's classical roots. This Wednesday - February 24, Avital will release Vivaldi, his third album on DG that returns the instrument to its origins-the Venetian Baroque and master composer Antonio Vivaldi. On this release, Avital captures the mystical spirit of Venice, shedding new light on Vivaldi's musical genius by performing his own transcriptions of the composer's works. He is joined on the album by the Venice Baroque Orchestra on this, the ensemble's twelfth recording on Deutsche Grammophon. Avital and the VBO are also about to embark on a major North American tour this spring, stopping in Southern California, Miami, Boston and Carnegie Hall as well as Calgary and Montreal Later today he'll perform at the University of Chicago Presents, but this morning, Lisa Flynn welcomes him to Impromptu. 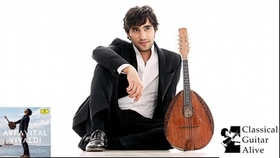 The GRAMMY-nominated Israeli mandolinist Avi Avital has been praised as a both an "enthralling and sensitive soloist" - Boston Globe) and a "convincing advocate for his instrument" - Wall Street Journal). As the first mandolinist signed to Deutsche Grammophon, he has brought the instrument to entirely new audiences, building a fresh legacy for the mandolin through virtuosic performance and a commitment to commissioning new works and arrangements in a range of genres. Avital new Vivaldi recording, his third album on DG, returns the instrument to its origins-the Venetian Baroque and master composer Antonio Vivaldi. On this release, Avital captures the mystical spirit of Venice, shedding new light on Vivaldi's musical genius by performing his own transcriptions of the composer's works, demonstrating the rock star status that he cultivated in his own time. He is joined on the album by the Venice Baroque Orchestra on this, the ensemble's twelfth recording on Deutsche Grammophon. Avital and the VBO are also about to embark on a major North American tour this spring, stopping in Southern California, Miami, Boston and Carnegie Hall as well as Calgary and Montreal Avital Avital - Vivaldi has been selected as the Classic 107 Classical Recording of the Month for March 2015. Tune in at 8:30 Monday morning March 2nd to hear this great new album and hear the interview with Avital and Classic 107's Michael Wolch. Then every Monday morning at 8:30a throughout the month, hear a new track from the featured CD, and a chance to win a $25 GC from McNally Robinson Booksellers. Bringing a new audience to the mandolin and the harpsichord, Avi Avital always seems to find mandolin ensembles in the most obscure places. Even before performing on stage at the Bristol Proms, he gave a masterclass to Bristol's mandolin group - a rare treat to play with one of the best mandolinists in the world. Speaking to Classic FM's Jane Jones, he explained exactly why he's planning to play some slightly more unexpected music in concert at the Bristol Old Vic. Playing the mandolin isn't just about playing Bach, he says. And sometimes, you might want to duet with another plucked instrument, the harpsichord, played by Mahan Esfahani. "It's nice to give a more panoramic view," he explained. "Both of the instruments tonight are not very commonly heard in concert halls in this setting, as a duo." Speaking about the concert's diverse programme, he added: "I think after you heard the Takemitsu, we go back to Bach, and you hear the Bach differently." 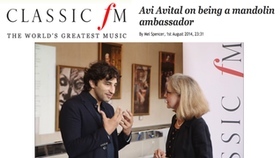 Watch Avi Avital's interview with Classic FM's Jane Jones. 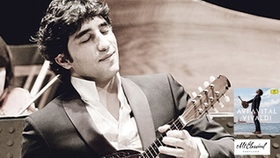 Avi Avital is the Israeli mandolin virtuoso. He showed his class in an unlikely 2012 album of solo Bach. Now with Between Worlds he is joined by very talented friends on accordion, harp, clarinet and other instruments in an entertaining programme of a dozen classical ''pops''. It is entertainingly ''different'' in arrangements of Villa Lobos' Aria from Bachianas Brasilieras No.5 (solo accordion and double bass forming the ''orchestra''), Bartok's Romanian Folk Dances, a traditional Bulgarian melody, Piazolla's tango Fuga y Misterio, Bloch's spiritual Nigun and Falla's lively Siete Canciones Populares Espagnol. There is a very new version of Dvorak's Finale from String Quartet No.12 ('American'), a traditional Welsh melody and Monti's Csardas with no violin in sight - an adventurous tour of musical worlds from east to west. 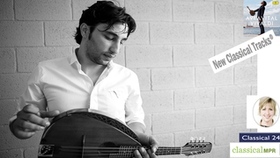 Avi Avital has been taking Australia by storm, touring to Sydney and Melbourne and introducing audiences to the virtuosic possibilities of the mandolin. 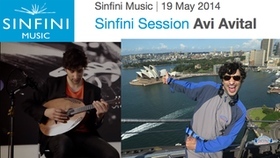 Last year we were lucky enough to have Avi perform at our live Sinfini Café session in the UK. He played a fantastic duet with the accordionist Martynas and it made us want to hear more. So we cleared a space in one of our meeting rooms and asked Avi to perform for us once again. Off the cuff, he did an incredible performance of the Prelude from JS Bach's Cello Suite No.1 on the mandola. The sounds he produces have such depth and variety of colour yet he makes it look effortless. WATCH THE Sinfini Music PERFORMANCE. Avi Avital is hurriedly knocking back a plate of noodles between interviews as I wander into the café where we are meeting. He's taking time to talk on day two of the Australian leg of his 30-day spin around the world, and within moments it's clear that he's a fellow blessed with energy, stamina and an appetite for food and good conversation. He's also a man with a mission – but more of that later. 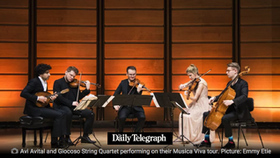 The Israeli-born Avital is here for a ten-day tour of Australia, courtesy of the Australian Brandenburg Orchestra. For a man who grew up in Be'er Sheva, a modest town in southern Israel, he seems to have developed a healthy case of wanderlust. After studies in Italy, he moved five years ago to Berlin, home to the Philharmonic, and his record label Deutsche Grammophon, and where he lives across the road from the soprano Simone Kermes – coincidentally the last Brandenburg guest artist I interviewed in this exact same café! But none of this was predetermined, for the classical mandolin isn't your usual instrument, and there was no roadmap for Avital's path to international celebrity. "It was a coincidence, like all great things in life are," he tells me. "I grew up in Be'er Sheva where they have a youth orchestra of mandolin players. It was founded by my first teacher, Simcha Nathanson, who was a Russian maestro who played the violin and the mandolin. One of my neighbours played in this orchestra and I went with my parents to a concert, and then I asked to play also." READ THE FULL Limelight Magazine INTERVIEW. 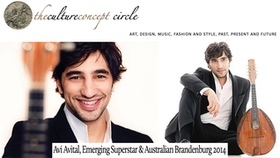 "He's handsome, he's fun, he's poised and refined, and plays with clarity and virtuosity beyond his years," says artistic director Paul Dyer of Israel's talented performer and composer Avi Avital, who will play with the Australian Brandenburg Orchestra for their second twenty fifth anniversary concert in May, 2014. 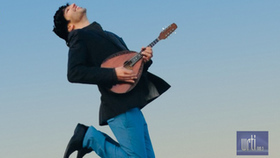 Avital is best known for his interpretation of well-known Baroque pieces and folk songs, many of which were originally written for instruments other than a mandolin. He is considered one of the emerging young superstars of the world stage right now, playing his chosen instrument of choice with a clarity and professionalism that belies his years. 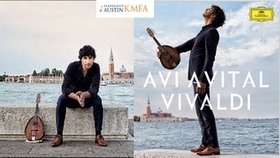 Avi Avital is "… a brilliant musician who has re-imaged the world of the mandolin" Paul Dyer noted, when talking about how he had chosen the emerging young virtuoso player to be on the orchestra's 25 Anniversary year program. Together they will ‘celebrate the mandolin, the chameleon of the music world, with a captivating journey of beauty and romance'. READ THE FULL Culture Concept Circle ARTICLE. 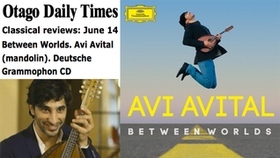 This week's ABC Classic FM CD of the Week focuses on the art of Avi Avital and his album Between Worlds. The Grammy-nominated mandolin player combines elements of classical and world/folk music to create unique, inspired arrangements. 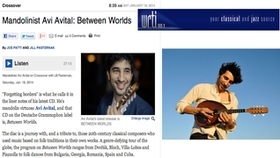 Grammy-nominated mandolin player Avi Avital has released his second album for Deutsche Grammophon/Universal Music tilted: Between Worlds. Reflecting a blend of genres, Avital uses an improvisational style to address traditional music combining elements of classical and traditional folk. 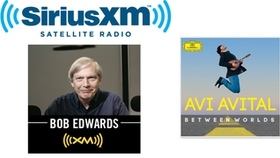 SiriusXM's Bob Edwards spoke with AA about the new album. 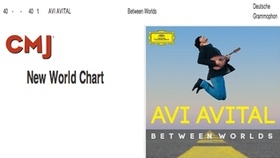 Grammy-nominated mandolin player Avi Avital releases his second album - Between Worlds for Deutsche Grammophon/Universal Music Classics. Reflecting a blend of genres, this adventurous musical journey has made it's way on to the CMJ-New World Top 40. 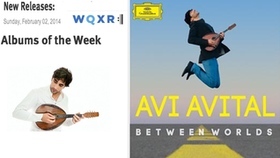 One of this week's featured albums@New York's WQXR is Avi Avital's 'Between Worlds.' Combining elements of classical and world/folk music, his Grammy-nominated mandolin player's approach in blending genres is both improvisational and traditional. 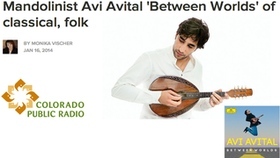 Grammy-nominated mandolin virtuoso Avi Avital's new album Between Worlds explores the intersections of folk and classical through mandolin arrangements of both folk traditionals and classical pieces. 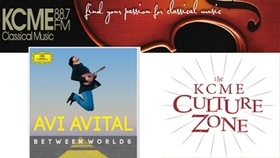 KCME Colorado Springs - Keith Simon speaks with Mr. Avital on 'The Culture Zone' about his new release, combining genres and being a mandolin player. Grammy-nominated mandolin virtuoso Avi Avital's new album Between Worlds explores the intersections of folk and classical through mandolin and WFSQ Tallahassee 'Cultural Notes' host Dan MacDonald, speaks with Avital TODAY, Friday January 24 @6pET. aon a show called Banjo Boom. Listen in. We're having fun. 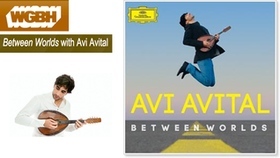 Grammy-nominated mandolin virtuoso Avi Avital's new album Between Worlds explores the intersections of folk and classical through mandolin arrangements of both folk traditionals and classical pieces. 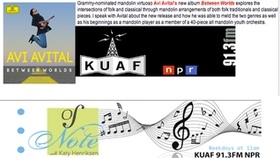 KUAF Fayetteville / Katy Henriksen speaks with Mr. Avital about the new release and how he was able to meld the two genres as well as his beginnings as a mandolin player as a member of a 40-piece all mandolin youth orchestra. 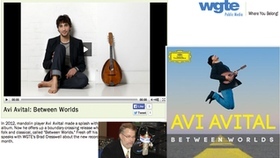 WGTE: Toledo Brad Cresswell interviews Mandolin Master: Avi Avital TODAY! !, Monday January 20th. 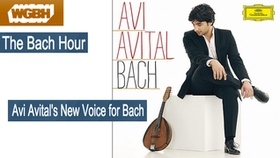 Avital made a splash with his first DG release, an all-Bach album. Now he offers up a boundary-crossing release which explores the intersection between folk and classical, called "Between Worlds." Fresh off his Carnegie Hall recital debut, the Mr. Avital speaks to BC about the new recording. 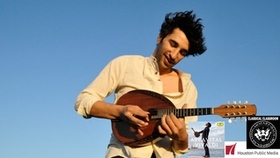 When Avi Avital arrived on the scene less than a decade ago, he set out to dispel the mandolin's somewhat dowdy reputation. After moving from his native Israel to Italy and then Berlin, he toured with Yo-Yo Ma's Silk Road Project and began playing Balkan and Klezmer music. "Between Worlds," his second album on Deutsche Grammophon, is a further effort to bridge the instrument's classical and folk identities. It focuses on new arrangements of classical compositions inspired by folk music, including works by Bartok, Piazzolla, Falla and Monti, among others. As part of his promo for the album, Mr. Avital stopped by the WQXR: New York studios recently for a Cafe Concert. Check out the attached video. 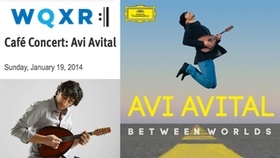 Listen to Avi Avital interview on WRTI: Philadelphia / TODAY!! "Forgetting borders" is what he calls it in the liner notes of his latest CD. 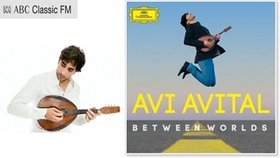 He's mandolin virtuoso Avi Avital and that CD on the Deutsche Grammophon label is, Between Worlds. The disc is a journey with, and a tribute to, those 20th-century classical composers who used music based on folk traditions in their own works. A genre-defying tour of the globe, the program on Between Worlds ranges from Dvořák, Bloch, Villa-Lobos and Piazzolla to folk dances from Bulgaria, Georgia, Romania, Spain and Cuba. 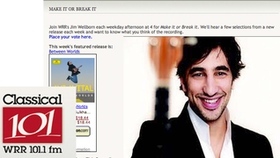 Listen to Jill Pasternak's conversation with mandolin performer Avi Avital, and music from his new DG CD, Between Worlds, on Crossover, TODAY!! Saturday morning at 11:30 on WRTI, with an encore the following Friday evening at 7 on HD-2 and the All-Classical web stream at wrti.org. Avi Avital plays Carnegie Hall / 'Salon Encores' TONIGHT!! 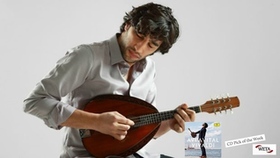 Recognized by The New York Times for his "exquisitely sensitive playing" and "stunning agility," mandolinist Avi Avital is one of the world's most exciting young musicians. 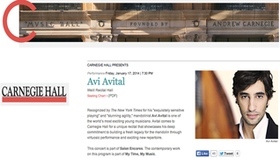 Avital comes to NYC's Carnegie Hall TONIGHT!! January 17 for a unique recital that showcases his deep commitment to building a fresh legacy for the mandolin through virtuosic performance and exciting new repertoire. This concert is part of Salon Encores. The contemporary work on this program is part of My Time, My Music. 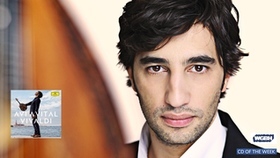 Avi Avital is blurring the lines of classical music. On his new DG recording: 'Between Worlds.' 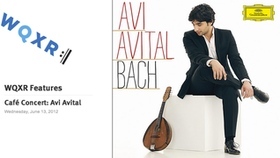 With this his second album, Avital's follow up to his Grammy nominated debut album of self-transcribed Bach concertos in 2012, the 35-year-old Israeli mandolinist explores music from Bulgaria, South America, Spain, Greece, Italy and Russia. Check out the 'making of' video of Between Worlds, and READ THE FULL Colorado Public Radio ARTICLE. Join WRR: Dallas Jim Wellborn each weekday afternoon at 4 for 'Make it or Break It', where you will hear selections from each week's new releases. 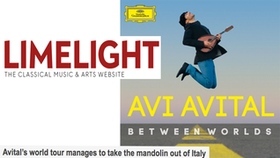 Grammy®-nominated mandolin virtuoso Avi Avital has been acclaimed for his "exquisitely sensitive playing" and "stunning agility"by the New York Times, while Israel's Haaretz has described Avital's playing as "everything you never dreamt a mandolin could do . . . truly breathtaking in virtuosity and dedication."